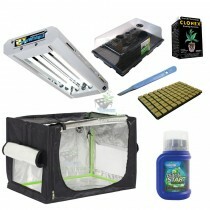 Grow kits are an ideal way of getting started without the hassle and worry of deciding on what products to piece together. All the following kits available from us have been carefully selected using our vast experience in the hydroponics industry along with feedback from customers. Grow kits can include, tent, light, outake fan, filter, 5 meters of duct, light hangers and thermo-hygrometer. All components of our kits are of high quality to ensure the end user can get growing in a quick, easy and efficient way. We have years of experience between us all here at Essexhydro-Garden, so if there is anything that you are unsure of, just require more information on a product or even want to piece together a kit of your very own please feel free to give us a call and one of the team will be more than happy to help and advise.